You've worn out your welcome, or at least your welcome mat. With a houseful of rooms to decorate, it's no wonder the doorstep has landed at the bottom of your sprucing-up to-do list. But in five easy steps (and less than one weekend) you can create an entryway that you'll be happy to come home to. 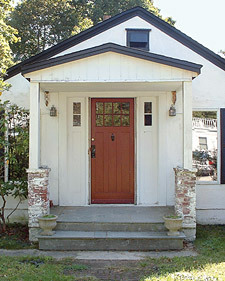 Blueprint deputy art director Cybele Grandjean and her husband, Robert Spica, gave plenty of TLC to the inside of their California-style bungalow on New York's Long Island, but the front porch was left pretty much as they found it (below). Associate style editor Kendra Smoot, (left), and senior home editor Rebecca Robertson helped upgrade the outside to match what's inside. "This mid-century eclectic look combines '50s-era accents -- inspired by Cybele and Robert's favorite furniture -- with a laid-back coastal vibe," says senior home editor Rebecca Robertson. The streamlined font of these stainless-steel house numbers was inspired by modernist architect Richard Neutra (the site that sells them has many other fonts as well). Rebecca painted a wrought-iron knocker white to help it mesh with the other hardware. 4-inch Neutraface numbers, customhousenumbers.com. Door knocker, castillodoors.com. You'll need to stock up on Halloween candy once the porch lights are upgraded. Downcast sconces make the doorway inviting by creating warm pools of light," says Rebecca. It's best to hire an electrician for outdoor wiring. Galvanized Sconces, Hi-Lite Manufacturing, 800-465-0211 for stores. Try this modern twist: Outfit your entry with a midsize all-weather rug instead of a standard 2-by-3-foot doormat (which can look dinky on a sizable stoop). This faux-rope weave serves as a pleasant reminder of the nearby ocean -- except that it's totally waterproof. 3-by-6-foot "Mariner Entry" mat, grandinroad.com. To fill the empty stretch below each window and improve overall proportions, Rebecca brought in tall concrete pots and bamboo shrubs. Start with a symmetrical display, she suggests, "then add one shorter vessel for contrast. Concrete planter, craftwareusa.com. MS-FX Metal stand, and FX planter, architecturalpottery.com. A coat of white paint instantly helps the porch feel newer and cleaner, while cheery yellow on the door hints at citrus-colored accessories inside. "We were nervous about using such a bright shade, says Cybele, "but it makes me happy every time I see it." Hollandlac Brilliant paint, $95 per 2.5 liters, finepaintsofeurope.com. This versatile look is well-suited to traditional styles of architecture. An old-world, handmade feel unifies the elements. 1. "Barbican Plain Porcelain" sign, mahvelousmailboxes.com. 2. Rustic glass sconce, potterybarn.com. 3. Macrame doormat, anthropologie.com for stores. 4. 12-inch oil jar, bauerpottery.com. "Long Tom" medium stoneware pot, marstonandlanginger.com. Perfect for minimalists and urbanites, this tidy scheme is an easy match for the clean-lined building trends of recent years. 1. Industrial steel house numbers, dwr.com. 2. Dioscuri indoor/outdoor wall sconce, ylighting.com. 3. Halsted doormat, ikea.com for stores. 4. Ceramic planters, sprouthome.com. Emeco 24-inch occasional table, twojakes.com.